Drivers headed to Tor Kielce, Poland as the opening round of the 2016 Federal Tyres King of Europe ProSeries, Pro2 and Queen of Europe seasons got underway. With qualification taking place on Friday, drivers were pushing their cars to the limits in the perfect weather conditions at the impressive high speed circuit, which features on the King of Europe calendar for the first time. With the ProSeries drivers having plenty of practice in the perfect dry and warm conditions, the weather suddenly turned which immediately changed the situation drastically. As the rain poured down on the track, the challenging qualification laps got underway for the drivers. Although they were facing the extreme conditions, it didn't stop them pushing as hard as they could - clocking entry speeds of over 155kph! Polish drivers are known for putting up a strong fight on home soil, and this round was certainly to be no exception as they occupied 9 positions out of the Top 10 rankings in qualifying. Austrian driver Alois Pamper would be the exception after taking 4th place. Paweł Trela would take 1st place, with Marcin Carzasty in 2nd and Jakub Przygonski in 3rd. 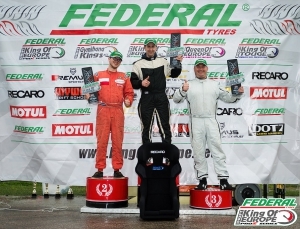 2015 Pro2 Champion Pavlin Penev would once again sit at the top of 40 drivers in the Pro2 series qualifications, Lukasz Gieras would take 2nd with Marcin Galat in 3rd. In the Queen of Europe series, Aleksandra Fijal would take 1st place in qualifying, with Katarzyna Zydb in 2nd and Karolina Pilarczyk in 3rd. Unfortunately for the drivers, the weather conditions didn’t improve throughout Saturday as the battles got underway. It would make for incredibly challenging conditions which would cause upsets for even some of the best drivers. 2015 ProSeries Champion Norbert Kovacik would face well-known local driver Pawel Trela in his Top 16 battle, despite solid driving from both it would be Trela who edged his way to the Top 8. 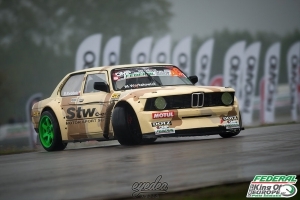 After taking 3rd place in 2015, Adam Frank would find him up against Alois Pamper in the Top 16, sadly a mistake from Frank in the first run cost him dearly and despite winning the second battle it wasn’t enough. The upsets continued in the Top 16 as the winner of the 2015 Polish round, and 3rd place qualifier Przygonski made a mistake which allowed his opponent Andras Molar to advance. French driver Laurent Cousin would go out to local driver Pawel Borkowski after an unfortunate error. In the Top 8, it would be French driver Mike Kauffmann who would fall victim to the Polish drivers, despite consistent driving throughout the weekend, with Maciej Jarkiewicz advancing to the Top 4. Austrian driver Alois Pamper would again progress after beating local driver Borkowski. Andras Molnar would put up a good fight against Marek Wartalowicz, with Wartalowicz edging his way past. 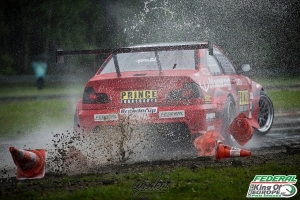 In the Top 4, it would see Pawel Trela face Alois Pamper, two drivers who had been on top form throughout the weekend. After a mistake from Trela in the first battle, despite winning the second battle, it would give Pamper enough points to head to his first King of Europe final. He would go up against Wartalowicz who knocked out Jarkiewicz. In the small final, Trela would go up against Jarkiewicz. After both drivers collided in the first corner, with Jarkiewicz at fault, it would hand Trela the third step on the podium. In the main final, after an incredibly close battle between Pamper and Wartalowicz, the judges were unable to decide a winner, which forced a one-more-time, much to the delight of the home crowd. This time it would be a mistake from Wartalowicz which would hand Pamper his first ever King of Europe ProSeries win! In the Pro2 series, 2015 Champion Pavlin Penev would make an unfortunate exit in the Top 8, which would allow opponent Adam Jarkiewicz to advance to the Top 4, which he would subsequently win to progress to the final. In the small final, Mateusz Pawlak would go up against Lukasz Gieras. It would be Gieras who took the win, handing him 3rd place. In the final battle between Jarkiewicz and Galat, Galat would win both battles 10-0, 10-0 to take the win, handing him the top spot on the podium. In the Queen of Europe series, Karolina Pilarczyk, who took 2nd place in the 2015 Championship would find herself up against Katarzyna Zdyb. After an initial 0-0 battle in the tricky conditions, Pilarczyk would win the second 10-0 after a mistake from Zdyb. With both Aleksandra Fijal and Pilarczyk fighting the tough conditions in the final, it would go to a one-more-time battle, before Karolina Pilarczyk was able to return to the top position on the podium to take the first win of 2016.